Delores Anne Ragland Linn of Kansas City passed away, Sunday, May 20, 2018 in Prairie Village, KS. She is survived by her son Jos Linn (Laura) of Kansas City, and her daughter Krista Siano (Scott) of Lawrenceville, NJ and grandchildren, Stella Linn, Lila Siano, Jackson Siano, and Sabrina Siano. Nothing brought her greater joy than spending time with her children and grandchildren. Delores was born in Lynchburg, VA and despite her move to the Midwest over 30 years ago, she always considered herself a Virginian. From her earliest days, Delores’ passion was music. Whether singing in a choir, playing the organ in church, performing Bette Midler songs at local coffee houses, giving piano lessons, or teaching Broadway show tunes to her grandchildren, music was the atmosphere of her life. 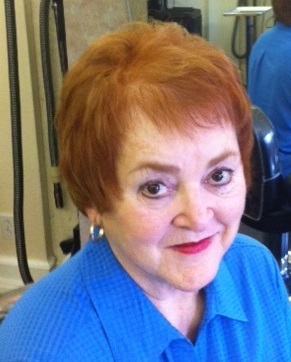 Delores earned a BA in Education and Music from Lynchburg College. She taught elementary school in Lynchburg, and also served as Choir Director at Fairview Christian Church, the church she grew up in. After moving to Kansas City, she began 20-year career as a teacher at St. Paul’s Episcopal Day School, primarily in first grade. Delores was one of the most beloved teachers at St. Paul’s by students and parents alike. She was known for her creativity, musical prowess, and putting the interests of her students above all others. Whether it was sharing “Big Papa” stories, directing one of her elaborate summer shows, or tap dancing on a table, “Mrs. Linn” left an indelible impression on all who knew her. A celebration of her life will be held Saturday, June 16 at 11 am at Westport Presbyterian Church, 201 Westport Road, Kansas City, MO. A reception at the church will follow the service. In lieu of flowers, memorial contributions may be made to the Westport Presbyterian Church, please note"Westport Concert Series" on memo line. I was so sorry to hear about Delores' passing. I taught at St. Paul's with Delores for many years. I was on the middle floor with slightly older children, but my class was often assigned her class as our "buddy" class. And how much fun we had together with Delores making up funny songs for us to sing and entertaining us with piano mastery! I never saw her in anything but a happy mood and so it's understandable why she was so beloved by all her students, and their parents as well. I wish I'd known she was at Brighton Gardens. My mother and mother-in-law were also residents there for some time and they both passed away there. It was a special place for my family and I hope Delores felt comfort while there. I'm glad Delores is at rest. I am so sorry to hear of Deloris’s passing. I taught with her for many years at St. Paul’s. She was an inspiration to my son, Matthew and he was lucky enough to be in MANY of her musical extravaganzas! She gave him the confidence, skills and desire to continue singing and theater at Rockhurst High School. I know her talents touched so many young people and she will be greatly missed! Peace to her family and friends. Delores was my friend and fellow teacher. We taught together in the Primary Division of St. Paul's for twenty years, the last six in first grade together. But, outside of our professions we enjoyed many travels together, twice to England and many weekend getaways to Lake of the Ozarks. Grandchildren Jack and Mya took piano lessons from Mrs. Linn. Jack was in Mrs. Linn's first grade, soaking up all the music and creative drama, now continues as a theater major in college. These past three years have been a difficult journey for my friend and I was glad to be able to see her and be with her during this time. Delores was a real trooper, as well as a friend, whom I will miss very much. Delores (or Ms Linn as we knew her from our kids) had such an impact on our lives. Whether it was providing the piano accompaniment for one of St Paul's plays that our kids were in or her teaching music, she really gracefully made a big impression on so many lives, especially the many kids of SPEDS. She was very special and will be missed but long remembered. Oh that belly laugh and her "lord have mercy". I remember it like it was yesterday. Ms. Linn was my favorite teacher, with her ever-present charisma and our shared passion for music and performance. 1st grade is a special time and for me it could have been a really challenging age. Instead it was filled with support and laughter, music and young blossoming friendships. Ms. Linn supported my love for music and though I was always terrified of the stage she worked with me tirelessly, as she did with all of her students, to prepare me. I have always attributed my continued love for the arts to Ms. Linn's early guidance and support. She even put me in a duet with my grade school sweetheart Kathryn B. so we could profess our young love though song and let me tell you, it was a BIG DEAL in 1st grade! You were there Zig. The last time I spoke to Delores she told me I was "one of her favorite persons of all time". Boy does that make me blush! I don't say that to boast but to rather reflect her deep devotion to her students even at such a young age. She didn't hold back from querying, "Do you still sing? If not what a waste of talent!" That is my Ms. Linn. Always putting it out there pushing me to reach for my dreams. For you Ms. Linn, I will throw on some Be-Bop-a-Lula" and sing it loud for ya! You will be missed and thank you for the memories. We loved your mother She was our daughter's piano teacher for many years. She came to me when Katie was in 2nd grade and encouraged us to consider lessons. She thought Katie would be a natural. And she was right! While most children started off with one 30 to 45 minute lesson a week Katie started with two 45 minute classes weekly. She continued that schedule for years. She loved to play and practice and learn the piano because Delores was such a good teacher. She gave our child a life gift. She was a blessing. To know Ms. Linn has passed is a great heartbreak to myself and my family. I am an alumni of St. Paul’s, and her love of teaching us music rubbed off on me. Music is my way of speaking when words don’t work, and Ms. Linn taught me how to do that. She was truly a light in this world, and I will miss her dearly. I know her star will shine so bright up in heaven !!! I send my love & prayers to her family & close friends. Mrs. Linn was one of the many special teachers our twins Adam & Natalie were blessed to learn from at St. Paul's. Her stories of "Big Papa", tap dancing on the classroom table for the kids(so bummed we never saw that! ), her very soft spoken voice that would totally command the room & her creative ability with musicals was incredible! We still remember the famous Bear Musical where each student was assigned a bear (Natalie a Polar Bear / Adam a Sun Bear). Shortly after the musical we had a family trip to the San Diego Zoo and the twins were adamant about finding each of the bears from the play! Great memories of her playing the piano at morning chapel, joyfully singing with the kids (and parents). You will be missed Mrs. Linn. We know you are now safely in God's arms - whole, thriving - singing & dancing again! God Bless. Oh, Mrs. Linn....one of my early mentors. She embraced me as her assistant as I re-entered St. Paul's as teacher instead of student. She taught me so much and allowed me to learn much on my own. I will never forget her. We were so lucky that our daughter was in Mrs. Linn’s class her first year teaching at St.Paul’s. And through summer programs and piano, it was a relationship that lasted through that daughter’s high school years, including Mrs. Linn being the subject of a college application essay. Mrs. Linn’s obvious love of children and teaching, her musical talent, and her southern charm made her unique, loved and long remembered. All the Magills send their condolences to the family. Mrs.Linn changed the course of my life in a way that I will be forever grateful for. She introduced me and my peers to some of the golden tunes from days of yore, and I perform them to this day at a hospice in Omaha. She gave me confidence in my musical talents and was the first person to show me how to read chord charts and sing along- a skill that has and always will bring me joy and peace. As a piano teacher, I try to pass on her warmth and love of music. Thank you for sharing her with the St.Paul's family for so many years. She is missed and never forgotten.